A fast and durable type from Continental with Double Safety System puncture resistance. According to Continental, "the perfect choice for the city speedsters, single-speed bikes and fitness bikes"
Note sure of the correct size for your bike ? See our blog post explaining wheel and tyre sizes. 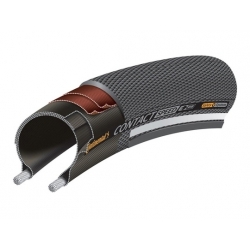 The Continental Contact Speed tyre is the successor to the Continental Sport Contact tyre.